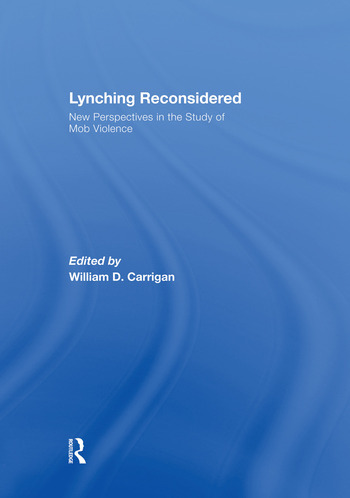 The history of lynching and mob violence has become a subject of considerable scholarly and public interest in recent years. Popular works by James Allen, Philip Dray, and Leon Litwack have stimulated new interest in the subject. A generation of new scholars, sparked by these works and earlier monographs, are in the process of both enriching and challenging the traditional narrative of lynching in the United States. This volume contains essays by ten scholars at the forefront of the movement to broaden and deepen our understanding of mob violence in the United States. These essays range from the Reconstruction to World War Two, analyze lynching in multiple regions of the United States, and employ a wide range of methodological approaches. The authors explore neglected topics such as: lynching in the Mid-Atlantic, lynching in Wisconsin, lynching photography, mob violence against southern white women, black lynch mobs, grassroots resistance to racial violence by African Americans, nineteenth century white southerners who opposed lynching, and the creation of 'lynching narratives' by southern white newspapers. WILLIAM D. CARRIGAN IS ASSOCIATE PROFESSOR OF HISTORY AT ROWAN UNIVERSITY IN GLASSBORO, NEW JERSEY. HIS FIRST BOOK WAS THE MAKING OF A LYNCHING CULTURE: VIOLENCE AND VIGILANTISM IN CENTRAL TEXAS, 1836-1916. HE IS CURRENTLY AT WORK WITH CLIVE WEBB ON A STUDY OF MOB VIOLENCE AGAINST MEXICANS IN THE UNITED STATES.